Seven Peaks townhomes by Polygon Homes. 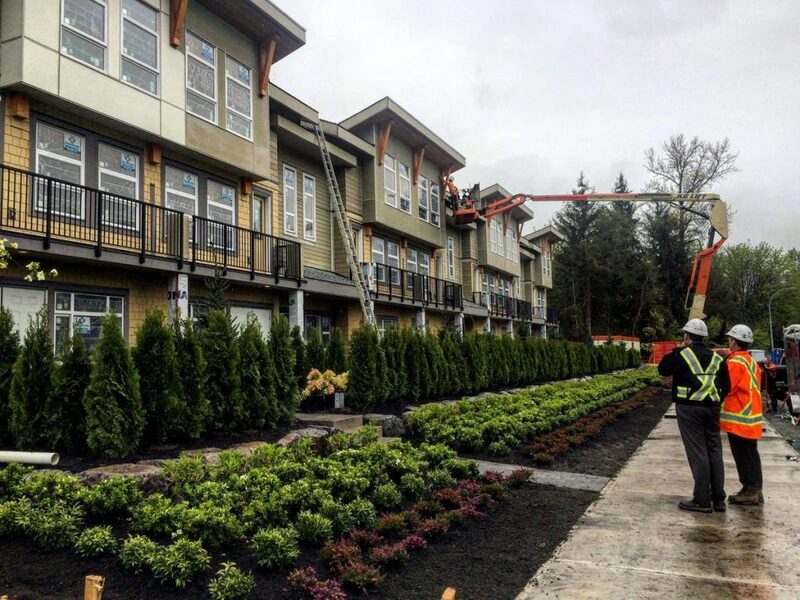 3 and 4 bed family friendly townhomes in Squamish, B.C. Michael Geller, a Vancouver architect, planner, real estate consultant, and property developer, has spent the better part of his 40-year career analyzing this topic and providing advice to all levels of government. Geller recently shared ten ways to cool housing prices. These include practical, easy to implement ideas to increase density without building high-rises. He believes with more density, prices aren’t as likely to rise as quickly. Most parking bylaws are outdated and often result in more expensive parking spaces than necessary. By reducing resident parking requirements and increasing car-share spaces, we can lower the cost of housing and help reduce greenhouse gases and traffic congestion. Reduced parking standards could also facilitate development of underutilized parking lots. Laneway houses are now permitted in Vancouver and some other Metro municipalities. Located at the rear of single-family properties, they result in new housing without significantly altering neighbourhood character. The size of the home is generally quite small and related to the size of the lot. These homes can’t be sold. It’s now time for all Metro Vancouver municipalities to permit laneway housing. Moreover, family-sized laneway houses for sale should be permitted on larger corner lots, and lots with smaller character homes that are to be conserved. Basement suites provide a significant amount of affordable housing. However, they’re generally not allowed in duplexes and townhouses. Municipalities should change zoning to allow this form of housing. They should also allow “lock-off suites” within apartments, such as those at SFU’s UniverCity. Think of them as “mortgage-helpers in the sky”. Many of us grew up in three-bedroom, one-bathroom homes of less than 900 square feet. Today, such homes are rarely built, in part because of subdivision regulations and high municipal charges. However, by allowing larger lots to be subdivided, and establishing municipal fees related to lot and house size, we could bring down the cost of new housing. All over the world, people own row houses that aren’t part of a condominium. However, this form of housing is rarely offered in Metro Vancouver due to a myriad of zoning and municipal regulations. Municipalities should zone more land to accommodate those who want to own a row house without having to pay monthly strata fees. After all, why should someone, who can often least afford it, pay someone else to cut their grass? Today’s industrial uses are very different than in our grandparents’ day. Around the region are thousands of acres of one- and two-storey light industrial buildings with extensive parking areas. We should be building housing on many of these existing and future industrial properties. If the required industrial space is built, we need not worry about a rise in land values. Many school, community centre, and church sites offer excellent potential for more housing, especially affordable housing. We should also be increasing housing densities around public parks. This is happening elsewhere around the world, and should be encouraged in our region. In addition to new forms of housing and zoning changes, alternatives to traditional owning and renting could reduce the cost of housing. Forms of tenure such as shared equity, a hybrid form of ownership; rent-to-own programs; and life tenancy (a good example is the Performing Arts Lodge at Bayshore), which offers the right to acquire housing at a lower cost than conventional condominium ownership, should all be explored. Many public and social housing projects were built at much lower densities than considered appropriate for today. While most non-profits don’t have the resources or expertise to redevelop these properties, municipalities, in concert with senior levels of government, could facilitate the creation of new housing through various forms of public-private-non-profit partnerships. While the federal and provincial governments have limited funds for affordable housing, municipalities can offer incentives such as density bonuses and reduced or deferred development fees to encourage affordable housing as part of new market developments. They can also “pre-zone” land to increase the supply of multi-family sites, and simplify approval procedures. Without allowing density increases and changes to zoning and the complex approval process, we’ll never make Vancouver more affordable or supply an urgently needed increase in the stock of affordable social housing.